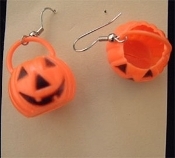 Vintage JACK-O-LANTERN TREAT PAIL BUCKET EARRINGS Dimensional Plastic Halloween Pumpkin Novelty Costume Jewelry - Dimensional Hollow Toy Charm, approx. 3/4-inch (1.88cm) wide x 1-inch (2.5cm) tall including handle. Fill with your own little treats!